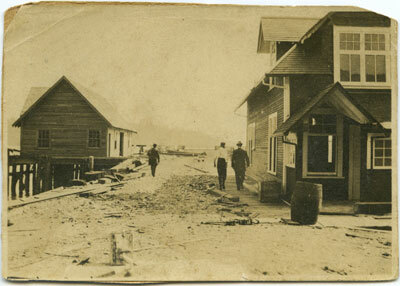 Black and white photograph, taken in 1913, showing Ambleside Wharf, looking towards the inlet. Also depicts several buildings and three unidentified men. Scanned November 2011 using Epson Perfection V700 Photo at 300dpi and 100% of original image size. Alternate Versions: Lossless TIF from original scan at 300dpi and 100% of original slide. W8 x H6 cm b & w print on photo paper. Negative Available.